Most of the people use WordPress to create free and simple WordPress sites. As an ardent WordPress user, you would like to customize your site and control it fully when the user count starts to grow. Fortunately, WordPress has compartmentalized architecture and flexible structure that helps you to change almost all things on your site and make it look the way you want. Among the website control tools, custom page templates are the most important apparatus. In this write-up, we will talk about top 10 tips to optimize the custom WordPress Themes easily and customize your site. Let’s get started. Caution: When you work with templates, you have to edit and change files in your active theme. Therefore, it is always important to use a child theme while making these types of customizations. It helps to avoid the risk of overwritten changes when you update the parent theme. In order to add a logo to the log-in page for admins, you must use login_head action hook. It easily performs all actions associated with the log-in the page’s head element. To do this, you need to perform two actions- (A) change the logo and change the link that points to it. Once you perform the above-mentioned action, the CSS code will replace the WordPress logo with your logo. Based on your needs, you can make adjustment to the image in the fourth line of the code to suite the theme you are using on your site. WordPress outputs a number of things in the head section, such as the wlwmanifest link, RSD link and generator meta tag. For a number of users, these elements are not useful. These days, webmasters provide the mobile versions of their sites with the use of different techniques. WordPress allows you to easily check the mobile Safari browser, which helps you to know when visitors access your site using an iPhone or iPad. You can use the following code to perform this action. Here, you can use the standard WordPress function wp_enqueue_style to add styles to the head element of the web pages. 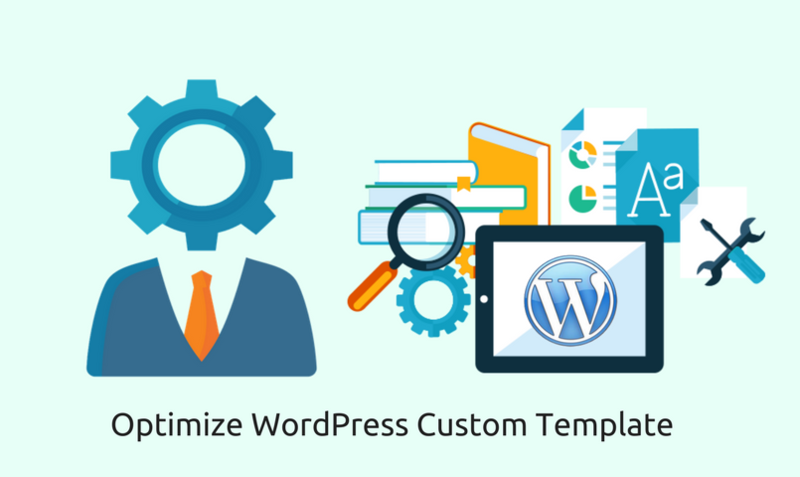 These are the top 10 tips to optimize custom WordPress templates. Just use them carefully and make the necessary changes in your WordPress sites to attract more visitors and lift your web-based business. Tracey Jones is a certified web developer by profession who provides WordPress customization service at HireWPGeeks Ltd. She has vast experience in creative and technical writing.